NOTE: In this issue, Haji Umar Mita, the octogenarian Japanese Muslim leader and scholar, is introduced. The life of a Japanese Muslim not only gives the account of an individual, it will also enable our readers to have a glimpse of a part of the history of Islam in Japan -Editor. Among the countries of Asia, the advent of Islam in Japan is perhaps the most recent development in its history, which is only about 65 years old, that is Islam found its way into Japan nearly 40 years after the Meiji Restoration in 1868, the turning Point of the Japanese history from feudalism to modernization. In the wake of the Meiji Restoration, early modern Japan reorganized its industrial and educational systems in the European and American patterns. Together with these western pattern of modernization, Christianity also made its inroads. Notwithstanding this fact, also during this time Islam got its way into Japan and quite a few Japanese were influenced and inspired, ironically, through anti Islamic propaganda by the interested forces, not through any Islamic preaching. They became the nucleus to open the path of Allah in this country. But these pioneer Muslims, like those in other countries, lived a poor life and died a poor death. 0nly three of them are still alive. Among them is Haji Umar Mita, the most typical example of the early Muslims in Japan. In fact, Haji Umar Mita is the most outstanding figure in the annals of Islam in this corner of the world. Now at the time of 82, this Grand Old Man of Islam in Japan can rightly be called the pride of the Japanese Muslims. Haji Umar Mita whose Japanese name is Ryoichi Mita was born on19 December 1892 in a samurai(warrior) family of Chofu Town in Yamaguchi Prefecture, western Japan. Since childhood Ryoichi did not possess a strong health or physique. His weak and ailing physical constitution caused delay in completion of his education. Therefore, at an advanced age of 24, in March 1916, Ryoichi graduated from the Yamaguchi Commercial College, the forerunner of the present Yamaguchi University. Soon after graduation he proceeded to China, for which he had been yearning so long. China was a very familiar name to Ryoichi from his childhood because of the Sino-Japanese Wars in the midninties of the last century and the Russo-Japanese Wars in the turn of the Present century. Ryoichi reared a dream for going to China all through his early youth. After graduating from college, he crossed over to China. This event not only became the first step toward the fulfillment of his long-cherished desire of seeing the continent but also gave him the first chance to come in contact with Islam. explaining Islam and the Muslim world. In 1912, Haji Yamaoka wrote and pub1ished a number of books on his journey through Arabia and on the grand spectacles of the pilgrimage of Haji in Mecca. Young Ryoichi, still a student, became highly impressed by the accounts regarding the Islamic lands contained in these books. Thus, it can be assumed that even before going to China Ryoichi had already acquired some background know1edge of Islam. formally accepted Islam although his heart was gradually turning toward Islam. In 1922, Ryoichi Mita joined the Manchjrian Railway Company and was posted at the Company's headquarters in Dairen(Dalian), Manchuria. There Ryoichi entered into his married life. In the office, Ryoichi Mita was in charge of the Inspection Section relating to the industrial inspection in Manchuria. In course of time, along with his promotion to the higher posts, he was transferred from one place to another, which enabled him to see many places including Mukden(Shenyang), Hurbin and so forth and to come in contact with many people. Meanwhile, the Manchurian Incident occurred and the successive long-drawn Sino-Japanese war began, leaving many innocent people in distress. 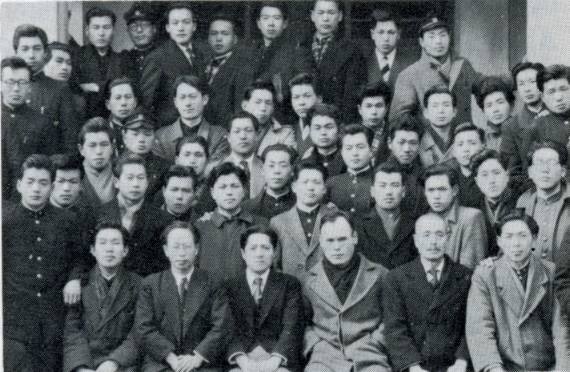 Though an official of the Manchurian Railway Company, Ryoichi Mita devoted himself to the relief of the distressed wherever he went around the northern China on his official duty. This gave him more chances to come in closer contact with the Muslims, thereby serving as incentives for strengthening his determination to embrace Islam. The year 1941 was the turning point in the life of Ryoichi Mita. Until then although for nearly 30 years he had known Islam, studied it, nurtured the fondness for Islam at heart, nay, although he was already a Muslim in his heart all through those years, he still did not embrace Islam formally. Maybe, this delay was due to the Buddhist religious tradition of a samurai family for generations, and his living environment up to that time was not quite favorable for a hasty change-over. When Ryoichi Mita was transferred to Peking, he decided to make his faith in Islam public. Therefore, he met Imam Wang Reilan of Nyuchie Masjid of Peking and under his guidance Ryoichi Mita formally declared his faith in Islam in 1941, received the name of umar, and became a dedicated servant of Allah. Thirty three years later, even today, Haji Umar Mita recalls that great moment with serene joy of fulfillment and also expresses his hearty gratitude for Imam Reilan for his kind and inspiring guidance during the days after Umar Mita's formal declaration of faith. Ryoichi Mita's steps toward embracing Islam teaches us a very valuable lesson that it is not the preachings or observance of ceremonies but the love for humanity originated from the deep faith at one's heart and the personal experiences that guide one to find out the way toward the truth. True, Ryoichi Mita was impressed by what Haji Omar Yamaoka had told. But unless Ryoichi Mita's inner heart gave him the right direction, nobody's preaching could change his mind. However, in the year of his declaration of faith, Umar Mita was 49 years old. In his occupational field he was assigned with the job of Counselor to the Supreme Council of the Federation of the Chinese Muslim Associations as a recognition of his vast, first-hand knowledge and experiences in the Chinese Muslim affairs and his close relations with the Chinese Muslims. Umar Mita lived in Peking until the end of the wars in 1945 when he resigned from his official posts and returned to Japan. Leaving behind his 30 years of long life in China, Umar Mita returned to his native Japan. After returning home he took up the job of teaching Chinese, first at the Kansai University in Osaka and then at the Kita-Kyushu University in the island of Kyushu. But after some time, he met with the disaster of losing his wife. Therefore, he gave up his teaching job in 1952 and settled in Tokyo and decided to engage heart and soul in the religious activities of Islam. A1most during this time, the Japanese Muslims who had so far been leading their individual Islamic life, established the Japan Muslim Association in cooperation with the foreign Muslims living in Japan. In the meantime, during the 30 years period when Umar Mita had been deepening his faith in Islam while in China, Islam was steadily taking root in Japan. The forces behind this progress was the initiative of Haji Omar Yamaoka who had all along been strenuously working for the building up a foundation for Islam in this country through lectures and publications; the Japanese evacuees from the South-East Asian Muslim countries where they came under the influence of Muslims there and became Muslim during World War II: and the Turkish Muslim refugees who settled in Japan after leaving their home in the Soviet Union. ln fact, the last group of Muslims, that is, the Tartar refugees played a very important role in influencing the Japanese Muslims in their Islamic life. Through their earnest and enthusiastic efforts and with the cooperation of some other friendly Japanese, the first Masjid in Japan was established in Kobe City in 1935 and the second in Tokyo in 1938. When Umar Mita came to settle in Tokyo in 1952, he was then 60 years old. In those days, the marks of war destruction of cities throughout Japan still remained. The life of the Japanese people was still in great distress, to say, it was extremely difficult for the common people to make both ends meet in respect of food, clothing and shelter. Even during this toughest of time Umar Mita chose to devote himself to the cause of Islam and to the learning of the Arabic language. He was always at hand when foreign Tabligh groups visited Japan and participated in all their works. In 1957,he went to Pakistan on invitation and undertook various journeys in connection with Tabligh activities in that country and had exchanges of thoughts with the Muslims of an out and out Muslim society. These journeys were not at all easy and safe, specially for the frail health of Umar Mita. In spite of that, God-fearing but undaunted Umar Mita continued his journey in the path of Allah. In 1958, joining with a Pakistani Pilgrims group he went to Mecca and fulfilled his life-long desire of Performing Hajj. After that, Umar Mita returned home and started his work with new vigor, In 1960, after the sudden death of Sadiq Imaizumi, first President of Japan Muslim Association, Haji umar Mita was elected its second President. During his term as President of Japan Muslim Association, he published his works: “ISURAMU RIKAI NO TAMENI”（Understanding Islam）and “ISURAMU NYUMON” (An Introduction to Islam) and “SAHABA MONOGATARI,” the Japanese translation of Urdu book HEKAYAT-E-SAHABA by Maulana Muhammad Zakaria and specially translated into English for Haji Umar Mita by the late Hafiz Abdur Rashid Arshad. Holy Quran was brought out by a renowned Japanese publisher and was circulated in a fairly large number. In this connection, it may be mentioned that three more Japanese translations of the Holy Quran were published in 1920, 1937 and 1950, respectively. A fourth translation from the origina1 Arabic was published in 1957. But all of these Japanese translations were rendered by non-Muslim Japanese scholars and obviously they lacked the Islamic stand-point. Moreover, the three previous ones were translated from English or other languages and more or less contained un-Islamic bias or absence of fairness. 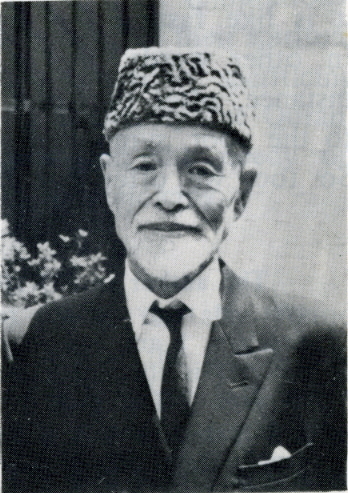 Therefore, Haji Umar Mita felt the need for a Japanese meaning of the Holy Quran prepared by a Japanese Muslim and from the original Arabic text. There was no other better person than Haji Umar Mita himself to undertake such a stupendous job. So he made up his mind to do the work himself. He was then 69 years old. He had the anxiety of his frail health and old age, but left the problem to Allah's mercy. In 1961, at the age of 70, Haji Umar once again left for Pakistan and, for a time, settled in Lahore to continue the work of translation, simultaneously, studying Arabic with the Arabic and Quranic scholars there. During this time, he established contact with Rabita-a1-Alam-al-Islami , Mecca, through the good offices of the late Hanz Abdur Rashid Arshad. On invitation, he visited Mecca and there he received pledge of support from the Rabita for the publication of the Japanese meaning of the Holy Quran. While staying in Saudi Arabia, he made wide contacts with the Quranic scholars of Mecca, Medina, Jeddah, Taif, Riyadh and so forth, and made considerable progress in his work. All through this work the inspiring guidance from the late Hanz Abdur Rashid Arshad is an unforgettable memory for him. Yet the more unforgettable event during his stay in Saudi Arabia was the death of Hafiz Arshad in a traffic accident. Haji Umar Mita was also traveling in the same car but somehow he was safe. In fact, that he survived and was able to return to Japan was a miraculous event in his life. This was in 1963 when Hafiz Arshad, Haji Mita and some other companions were proceeding to Mecca from Medina by car. When the car reached Badr, it met an accident and turned turtle. Hafiz Arshad died instantly. Haji Mita escaped death but received serious injury. In course of time, he recovered from the injury and the shock of the accident. The Rabita extended its most generous help and hospitality all through the time of treatment and recovery after the mishap. Haji Umar Mita presents a copy of the Japanese Quran to Ambassador Dejani of Saudi Arabia. 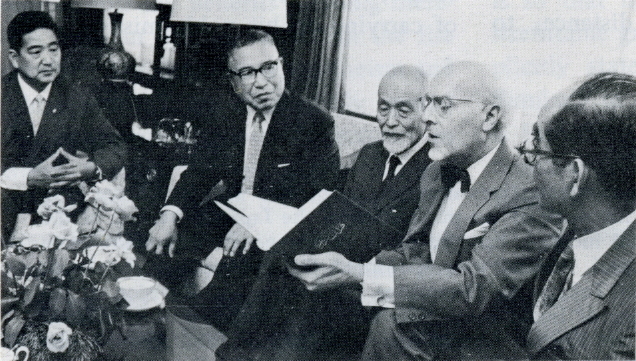 From left: Usman Uenoya, Printer of the Japanese Quran, Abu Bakr Morimoto, Haji Umar Mita, Ambassador Dejani and Hideji Tamura, former Japanese ambassador to Saudi Arabia. After returning home, Haji Umar Mita continued treatment, at the same time, he also went on with his translation work. During this period, he sometimes lived in Miyazaki in Kyushu and sometimes in Enzan city in Yamanashi Prefecture, for the purpose of recovering health as well as doing his work in a peaceful atmosphere away from the din and bustle of the big cities. During his stay in Enzan, he met with Abu Bakr Morimoto, another stalwart of the Japanese Muslims, for the first time, in 1965. It was a happy occasion in that Haji Umar Mita felt relieved of anxieties regarding printing of the Japanese meaning of the Holy Quran by availing of the cooperation of a Muslim printing expert such as Abu Bakr Morimoto. In 1968, the translation of the text was completed and its first revision was accomplished by a committee of revision and review, appointed by the Japan Muslim Association, after continuous study and review for about a year and a-half. Carrying the revised manuscript of the translation, Haji Umar Mita went to Mecca in June 1970, taking Brother Hussain Khan of Pakistan with him. At Mecca, the manuscript was again revised by a committee of scholars appointed by Rabita-al-Alam-al･Islami. After about six months of painstaking review, the work was finally came to the stage of printing. Haji Umar Mita then returned to Japan and the manuscript went to the printing press of Takumi Kobo Printing Company of Hiroshima, owned by another Japanese Muslim. At long last, on 10 June 1972, the printing of the Japanese meaning of the Holy Quran was complete and its first edition was published after 12 years of painstaking and strenuous efforts of Haji Umar Mita who was then already 80 years old. Even after the publication, Haji Umar Mita has continued to write notes of the translation. Although busily engaged all the time in the work of writing the meaning of the Holy Quran, Haji Umar Mita did never forget his other duties as Muslim. While performing his normal duties, he takes time out to guide the activities of the Japan Muslim Association as its Counselor. Even at this age of 81, he commutes from his home in the suburb of Tokyo, a two hours distance, to the Tokyo Masjid and to the Association's office. This life pattern of Haji Umar Mita is really an example before the younger generation who are fortunate to receive his guidance regularly. In March 1974, he once again visited Mecca and in November of the same year, attended an Islamic conference held in New Delhi, India. Haji Umar Mita became 82 on 19 December 1974. Let us pray to Allah for his long and healthy life so that his living example can inspire and guide the Japanese Muslims, now and in the future, to enable them to become worthy of carrying on his noble mission. Saudi Arabia, Brother Ahmed Suzuki of Japan, H. E. Mr.Hideji Tamura, former Japanese Ambassador of Japan to Saudi Arabia, Brother Mustafa Komura of Japan, Dr. Aly Hasan E1-Samny and Brother E1-Sebai, both of Egypt, and many others.